WPF: This article is one result of a recent study of cooperativism in Nicaragua undertaken by Rene Mendoza and Edgar Fernandez on behalf of Winds of Peace Foundation. It offers a hopeful perspective with regard to the current growth of cooperatives and what they are capable of achieving on behalf of their members. 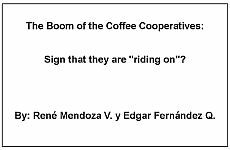 Boom of the Coffee Cooperatives: Sign that they are “riding on”?